It's a cute math puzzle. - Tap ermines to choose panels. - Press [Back] to cancel. 2. Not only one math formula! - If it's correct, go on to the next question. 4. Solve 20 questions to clear a game! - The game ends when the allotted time runs out. - For each correct solution, the time increases by 10 seconds. - The more panels you use, the more score you get. - 「×」and「÷」panels give more points than other panels. - Use these panels as many as possible! The game supports online ranking. 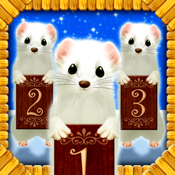 Study with ermines to reach the top of the ranking.